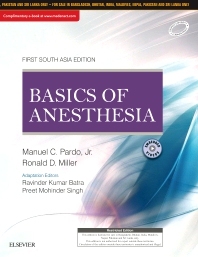 The undisputed leading text in its market, Basics of Anesthesia provides comprehensive coverage of both basic science and clinical topics in anesthesiology. Drs. Manuel C. Pardo, Jr., and Ronald D. Miller, in conjunction with many new contributors, have ensured that all chapters are thoroughly up to date and reflect the latest advances in today’s practice. Unparalleled authorship, concise tex t, easy-to-read chapters, and a user-friendly format make this tex t the #1 primer on the scope and practice of anesthesiology. Presents the combined expertise of two of the most prolific and renowned anesthesia exper ts worldwide, along with more than 80 exper t contributing authors. Includes new topics and chapters on Anesthetic Neurotoxicity, Palliative Care, Sleep Medicine and Anesthesia, New Models of Anesthesia Care: Perioperative Medicine, the Perioperative Surgical Home, and Population Health, Anesthesia for Trauma, and Human-Induced and Natural Disasters. Features high-quality images that of fer a detailed visual understanding of regional anesthesiology and much more. For many chapters, South Asian perspective has been added to have a clear understanding of the Indian scenario. Exam-oriented questions based upon previous years’ MD and DNB examinations across India have been provided at the end of every chapter. Information on infective diseases like tuberculosis (even in active stages) that need anesthesia optimization has been provided. Also, non-cardiac anesthesiologists are daily faced with varying presentations of rheumatic hear t disease, which is of ten a rarity in the developed world. Detailed discussion has been done on such topics. Videos have been provided on various anesthesia procedures and practices. David L. Robinowitz, Scott Richard Springman and Manuel Pardo Jr.
Tae Kyun Kim, Shinju Obara, Ken B. Johnson and Manuel Pardo Jr.
John Feiner and Manuel Pardo Jr.
Erica J. Stein, David B. Glick and Manuel Pardo Jr.
Rachel Eshima. McKay and Manuel Pardo Jr.
Helge Eilers and Manuel Pardo Jr.
Talmage D. Egan, Cynthia Newberry and Manuel Pardo Jr.
Charles B. Berde and Manuel Pardo Jr.
Ronald D. Miller and Manuel Pardo Jr.
Sulpicio G. Soriano, Mary Ellen McCann and Manuel Pardo Jr.
Rebecca M. Gerlach, BobbieJean Sweitzer and Manuel Pardo Jr.
Patricia Roth and Manuel Pardo Jr.
Kerry Klinger, Andrew Infosino and Manuel Pardo Jr.
Alan J.R. Macfarlane, Richard Brull, Vincent W.S. Chan and Manuel Pardo Jr.
Edward Yap, Andrew T. Gray and Manuel Pardo Jr.
Kristine Breyer and Manuel Pardo Jr.
Kevin K. Tremper, Magnus Teig, James Szocik and Manuel Pardo Jr.
Linda Liu and Manuel Pardo Jr.
Elizabeth Frost and Manuel Pardo Jr.
Art Wallace and Manuel Pardo Jr.
Jin Huang, Stephen Weston, Scott Schulman and Manuel Pardo Jr.
Andrew James Deacon, Peter D. Slinger and Manuel Pardo Jr.
Anup Pamnani, Vinod Malhotra and Manuel Pardo Jr.
Amy C. Robertson, William R. Furman and Manuel Pardo Jr.
Lingzhong Meng, Alana Flexman and Manuel Pardo Jr.
Steven Gayer, Howard D. Palte and Manuel Pardo Jr.
Andrew D. Rosenberg, Mitchell H. Marshall and Manuel Pardo Jr.
Jennifer Lucero, Mark Rollins and Manuel Pardo Jr.
Erin Gottlieb, Dean B. Andropoulos and Manuel Pardo Jr.
Sheila R. Barnett and Manuel Pardo Jr.
Randolph H. Steadman, Victor W. Xia and Manuel Pardo Jr.
David M. Dickerson, Jeffrey L. Apfelbaum and Manuel Pardo Jr.
Wilson Cui, Chanhung Lee and Manuel Pardo Jr.
Theodora K. Nicholau, Melissa Haehn and Manuel Pardo Jr.
Robert W. Hurley and Manuel Pardo Jr.
John Turnbull, Linda Liu and Manuel Pardo Jr.
Marc P. Steurer, Tony Chang, Benn Morrie Lancman and Manuel Pardo Jr.
Joseph H. McIsaac III and Manuel Pardo Jr.
Omar Hyder, James Rathmell and Manuel Pardo Jr.
David Shimabukuro, Krishna Parekh and Manuel Pardo Jr.
Amr Abouleish and Manuel Pardo Jr.
Daniel Cole, Karen B. Domino and Manuel Pardo Jr.
Avery Tung and Manuel Pardo Jr.
Sarah Gebauer and Manuel Pardo Jr.
Frances Chung, Mandeep Singh and Manuel Pardo Jr.
Neal H. Cohen and Manuel Pardo Jr.